Request an on-site course, or a course in your city. Please note that empty course dates may shift based on demand. Our course material fulfills the 35 training hours required by PMI. Our 4 day PMI-PBA exam prep course prepares you to easily pass the 200 question, 4 hour PMI-PBA certification exam. Read more about the PMI-PBA Certification from PMI. Professional in Business Analysis credential. Attend our four day class and get certified. We have partnered with Simon-SezIT to offer you a complimentary 'Learning Microsoft Visio 2013' DVD! This is 10 hours of excellent training on Visio 2013. After achieving your PMI-PBA, the Project Management Institute requires you to participate in 60 or more hours of Professional Development Unit's (PDU's) over the next three years. We have scanned the internet and put together a guide to 120 FREE PDU's found across the web. Every PMI-PBA class attendee receives this guide. Purchase our guarantee and get a refund if you don't pass the PMI-PBA exam. 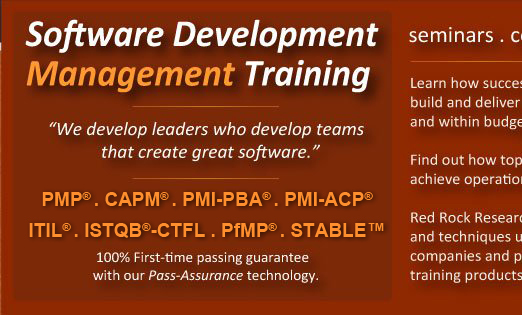 Red Rock Research is thrilled to offer our attendees Pass-Assurance Technology. This technology--exclusively developed by Red Rock Research--shows you when you are finished studying and are ready to take the test. Our instructors are friendly, educated, and have real-world Agile and PMI Project Management experience. Our course fulfills all of the 35 contact hours required by PMI for the PMI-PBA certification. Our locations are warm, quiet, and comfortable. We have the best guarantee in the industry that you can opt into. If you purchase it, we guarantee you will pass the PMI-PBA exam on the first try. If you can't after two more attempts that we pay for, we'll give you the rest of your money back. We have an on-line test simulator with over 200 questions. We have Pass-Assurance Technology. This helps you know when you are finished studying and are ready to pass the test. After you attend our course once, you are welcome to sit in on our PMI-PBA course at any future time throughout your career. Our PMI-PBA exam prep course contains specialized memory-training exercises novel to Red Rock Research. Attendees will engage in memory-training exercises that enhance the ability of the attendee to remember facts and formulas. Attendees will also have access to our on-line test simulator, containing sample test questions similar to the PMI-PBA Certification exam. Am I guaranteed to pass the PMI-PBA Exam? Red Rock Research offers an optional first-time passing guarantee for the PMI-PBA exam. This means we guarantee you will pass the test on your first try. The PMI-PBA is a difficult test and we take our guarantee seriously. If you don't pass the test on the first try we will pay for your second attempt. If you don't pass on your second attempt, we will pay for your third attempt. If you don't pass the PMI-PBA on the third try, PMI requires you to wait an entire calendar year before your next attempt, and Red Rock will refined you the cost of the course minus the test we have paid for already. Check our guarantee against others and be sure they give you all of your money back, like we do. We have noted that many other providers keep a 'processing fee' when issuing refunds. What is your pass rate for the PMI-PBA Exam? Our official pass rate for the PMI-PBA Exam is 100%. While that is a fact, you need to understand when test prep providers publish this figure they are describing how many participants pass the test within 3 attempts--and not processing a refund. The majority of our students in each class pass the PMI-PBA on the first try. What makes the difference? The amount of time you study! People who study pass the test, people who don't study have to take it over again. What can you tell me about the PMI-PBA Exam? The PMI-PBA Exam spans 4 hours and has 200 multiple-choice questions with four possible answer for each questions. This gives you about 1.2 minutes per questions. What are the prerequisites for the PMI-PBA exam? How many questions are on the PMI-PBA Exam? The PMI-PBA Exam has 200 multiple-choice questions. How much time do I have to complete the PMI-PBA Exam? You have 4 hours to complete the PMI-PBA Exam. This translates into 1.2 minutes per question. How many times can I take the PMI-PBA Exam? PMI allows you three attempts to pass the PMI-PBA exam. If you can't pass it in three attempts PMI requires you to wait one year to test again. Where in the LAS VEGAS area can I take the PMI-PBA Exam? The PMI-PBA exam is take at a prometric testing center. You can locate a prometric testing center in your area from their website: www.Prometric.com. Testing centers are typically associated with schools in the area and as such are open or closed in conjunction with their school calendar. Should I become a member of PMI? 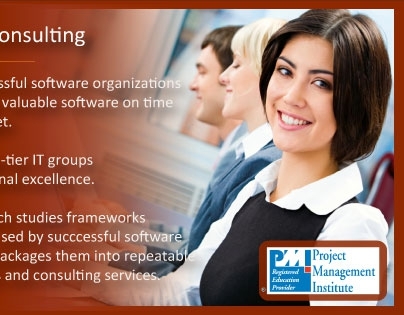 Membership in PMI has many benefits. Membership presently costs $129.00/year and generous discounts are available to students and retired professionals. The most immediate benefit for becoming a member of PMI is the cost of membership plus taking the PMI-PBA exam is slightly less than the cost of the test alone for non-members. Red Rock recommends you become a member of PMI. Where do I start my application for membership in PMI? Apply for membership in PMI here. Where do I start my application for become a PMI-PBA? Apply for you PMI-PBA application directly on PMI's website here. How much does the PMI-PBA Exam cost? The PMI-PBA Exam presently costs $405 for members, and $555 for non-members..
How much does membership in PMI cost? Membership in PMI costs $129/year. Generous discounts are available for students and retired professionals. Should I start my PMI-PBA application before coming to class? Preferably, you should start your PMI-PBA application and finish it before class begins. This is because PMI can take up to 5 business days to respond to your application. If you wait until class starts you will be pushing back the soonest you can take the test by at least 5 business days. This being said, people sometimes do show up on day 1 without starting their application. How can I show people I have passed the PMI-PBA? Is there an official PMI-PBA registry? Yes. PMI maintains a public list of PMI-PBA credential holders. You can find it here. Is there a published curriculum the PMI-PBA Exam is based on? The PMI-PBA is based on 11 books. PMI has published the list here. We have condensed the information in those books into our three day course. What score is needed to pass the PMI-PBA Exam? PMI requires a 62% to pass the test. Understand, though that this number should mean absolutely nothing to you because the test is difficult and structured with questions that are extremely tricky. What is needed to maintain a PMI-PBA certification? To keep your PMI-PBA credential current you must accumulate 60 professional development units (PDU's) of PMI-approved agile training during the next 3 years. Most of Red Rock's courses count towards these. PMI-PBA Posts From Our Blog . . .